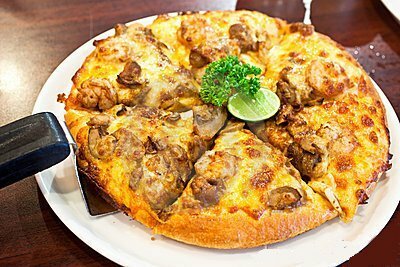 Go a little exotic with this Thai chicken pizza recipe. This simple and delicious healthy pizza is great for a change to your taste buds. Looking to spice up your a ho-hum meal? This pizza will knock your socks off! Go a little more out of the ordinary with this yummy and simple recipe! Preheat oven to 450°F. Place rack low. Coat a large baking sheet with cooking spray. You can also use a pizza baking stone if you have one. Sprinkle stone with flour or cornmeal. Roll out the dough on a lightly floured surface into a rough circle. Transfer to the baking sheet or stone. Bake on the bottom rack until puffed and lightly crisped on the bottom, 8 to 10 minutes. While the dough is baking, whisk peanut butter, water, soy sauce, vinegar, ginger and garlic in a small bowl until well combined. Heat oil in a skillet over medium-high heat. Add chicken and brown, stirring, until cooked through, 2 to 4 minutes. Transfer to a medium bowl. Add bell pepper, scallions and 1 tablespoon of the peanut sauce to the chicken; toss to combine.